Nigerian has one of the richest, enduring and perhaps, the most sophisticated culture on the continent of Africa. As a way of portraying our culture, Miss Ojuloge International Beauty Pageant which tend to promote our culture and heritage through modern age fashion hereby present her pageantry second edition tagged ‘King of Queens‘. 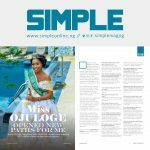 Miss Ojuloge Beauty Pageant is organized by Jumade Entertainment, an entity founded by Nigeria Nollywood Female Actor, TV and Red Carpet Host, Mediaprenuer, Olajumoke Ajadi. Miss Ojuloge Pageant is an international beauty pageant opens to ladies between the age of 18 and 25years. The pageant aspires to provide contestants an opportunity to display their talents, highlight the true beauty of their minds, souls and accomplishment as modernized women. The Pageant will be filled with glamour and intellectual life. The grand finale night will allow contestants to spread awareness via advocacy, shine with their beauty, intellect, personality and character. They will be challenged with high fashion shoots, movie acting, and speeches on women empowerment. With a fair point scale from the panel of Judges, the chosen Miss Ojuloge International beauty 2018 will be worthy of her title. Are You a Model, Aspiring Model or Non-model? Are you between 18years +, Are You Smart? Beautiful, Intelligent and Courageous? Would you like to become a Successful & Recognize Beauty Queen trending on top social media’s, magazines and newspapers? Take a BOLD step and see the chances lying behind you. This is your chance to make an impact and be known. Pay/Transfer a fee of 5,000 Naira into Keystone Bank Account Name: Jumade Entertainment Account number: 1006893304. A copy of the deposit slip or screen shot of it. Send the following requirements after the payment; send one studio portrait photos with high digital quality (Silver or White Background). Name •Age •Biography •Location •Phone number •Instagram Handle •Statistics (Burst, Hips & Waist). Send to us why you will like to become the Next Miss Ojuloge International Beauty Queen and what you intend to do with your crown/position?